Darren was excited and nervous about his wedding, but he couldn’t wait to share the big event with his closest friends! The first guests to arrive were his best man, Joshua Lords, and their good friend, Ricky Jordan. Strangely, when Darren came out onto the porch, he overheard Joshua and Ricky arguing, then both of them fell silent when he came through the door. “What?” Darren gasped. By then, Ricky was already inside the house and couldn’t answer Darren’s question. Joshua told him, “In all of Skylar’s activity, including public video cameras and service access of any kind, there was never a hint of activity after that afternoon. How she could’ve reached Oasis Springs without using the Tube or being seen is a complete mystery.” He sighed again, but with less anger in his face. “Sadly, I can’t stay for your wedding now,” Joshua stated. “Well, now you have an official heir, so I’m thrilled for you! Send Clara mine and Daria’s love. When things settle down more, let’s get everyone together,” Darren suggested. Joshua agreed and left the wedding party to search Ricky’s house with a team of crime scene investigators. “Thank you so much,” Daria said to Indra, with the most deliberately cordial smile. “Why don’t you let the caterer do that?” Ricky wanted to know. “Because the only caterer I trust is a guest, obviously,” Darren rolled his eyes at Ricky when he said it. In the front room of the house, the ladies were getting along much better already. Persephone made the other women laugh with her jokes about being a drunken socialite, and she also complimented Daria on her music. “You’ve heard my music?” Daria couldn’t hide her surprise. “You think so?” Daria felt so flattered, and felt hopeful that she would be able to make some friends at last, despite Indra’s demeanor. Darren stood alone outside for a moment. The gazebo in the backyard was done up beautifully for the wedding ceremony, and the view was especially picturesque. He looked around and memorized every detail of the scene while trying to make sense of his own emotions. He pretended he was inviting an invisible crowd, “Come and witness my spectacle!” Finally he worked up the courage to begin the ceremony for real. Indra and Persephone hurried to pass through the kitchen to the backyard, and Ricky was actually flirting with the caterer. “You never change,” Indra pointed out as she walked by him. Daria led the procession to the wedding arch, as is the custom in the District. She wished she had close friends to be her true bridesmaids, but she was grateful to have new friends that cared about her husband and her step-children, at the very least. “It’s so beautiful,” Daria replied, as the other women exited the house and began making their way to the gazebo as well. “That’s great news,” Daria whispered back as the other women shuffled around and disagreed about seats. “I’m sitting right here,” Persephone whispered. “Fine. I’ll sit on Darren’s side then,” Indra practically hissed. As she turned her back, she could feel the sting of Persephone’s evil eye. Indra ignored it–she didn’t care if Persephone got upset with her. Weddings always make Indra cry, but only because they make her feel alone. This time, Indra also felt like crying because her best friend’s life-as-she-knew-it was over, and she worried she’d never see Skylar again. As she walked over to the groom’s side of the isle, Darren grabbed Daria to make-out with her like a love-sick little boy. Indra struggled harder to keep her emotions in check. “It’s a wedding; they love each other,” she reminded herself silently. She took a seat and breathed in and out slowly a couple of times, until she felt a little stronger. Darren took Daria’s hand, saying, “And then there’s you,” before he kissed her hand gently. Just as the bride and groom got into position to begin exchanging their vows, Indra bolted from the gazebo with hot tears streaming down her face. 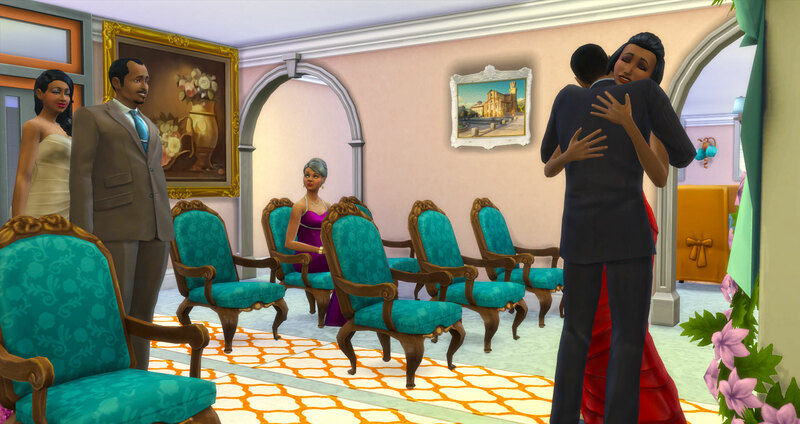 This entry was posted in Sims 4 Stories and tagged awkward moment, caterer, Daria Sayansky, Darren Randall, drinking, Indra Moreau, Joshua Lords, Persephone Marchand, Ricky Jordan, sims 4, sims story, Uncertainty Principle, wedding cake, wedding party. Bookmark the permalink. [gasp] OH! You’re right! It said they were ABOUT to exchange vows! Oh my goodness…you’re about to do something! I can feel it! You’re going to shake the world lol. Love it!! I can only assume that Myra is looking at everyone sitting on ONE side of the aisle and wondering why they all chose to sit in the back lol. That’s never happened before. Usually they all sit toward the front and are nicely spread on both sides of the aisle. That’s so cute! Well, Indra never changed seats in the scene. They just sort of had to figure out where they were going to sit. I guess Indra wanted the spot Persephone went for, since she was going for it, but then she went over by Darren’s side because she’s so mad about Daria. I would be so happy if I ever found out that the geniuses at Maxis actually programmed that some kind of way. Like, whatever side the bride is on, if the people with the highest relationship with her sit on that side and vice versa. Not sure what to do about the people who stand the whole time, but…whatever. I read something in the GA forums from one of the gurus saying that there are more to our Sims that we know. One thing he mentioned was that Sims have handedness just like humans, and just like us, most Sims are right handed! Ever since reading that I wonder if EVERYTHING is programmed now lol. lol, right! Those things are cool, and I would really love to think that they are purposeful. But then things that should happen because of programming don’t happen at all or don’t happen well…like jealousy. Drastic improvements need to be made in that area. Drastic! I agree! I think that it should be easier for sims to just not “click” too, and I don’t mean romantic either. It should be like there’s just a small chance that a sim is predisposed to respond negatively to all attempts at positive interactions 🙂 I’d love that, to be trying my hardest and never be able to succeed! Sometimes it’s just too easy. This is true. Your scenario works very well romantically, but you’re right. It would be great if it worked in platonic relationships. There are two Sims I’ve been trying to get together for half of my Sims’ life (he’s still young lol), but she is just not very responsive to him, but they are the best of friends though.